Very soon Facebook users (which, let’s face it, is just about everyone) will no longer be able to ignore Facebook Timeline. The new format will be rolling out by February 1 to all users. And with it, comes around 60 new lifestyle applications, with three familiar names in the travel world: TripAdvisor, Gogobot and Foodspotting. It has never been easier to share your travels plans—past, present or future—with friends and share the foods you love. TripAdvisor’s app is called Cities I’ve Visited. The app allows you to pin cities you’ve traveled to on your travel map, display it on your timeline and many other personal travel stats on Facebook Timeline. You can share with your family your trip to Morroco, and what monuments you visited and restaurants you dined at. It’s a great way to take advantage of the new storytelling aspect of Facebook Timeline through travel. Gogobot’s app is similar, but turns users into travel experts rather than just telling stories. When you use the Gogobot app with Facebook Timeline, your records of where you’ve been, what restaurants you’ve ate at and what attractions you saw are compiled into a “Destination Guide.” You can not only share this guide with your friends and family, but also act as a travel guide to show them the best places to eat and play. You can share upcoming trips and ask questions from friends, and display customized postcards made from Gogobot’s iPhone application. You can also express your dreams by listing the places you want to visit. The more interaction you post to Facebook Timeline, the more Gogobot Travel Expertise points you receive to make you a trustworthy source on travel. Foodspotting’s app also focuses on sharing. What’s better than a tasty dish? Sharing your pleasure with all your friends, of course? Now it is very easy to share your Foodspotting activity on your Facebook Timeline. You can control who sees your Foodspotting activity, fortunately, and it is all contained in one little box so it won’t clutter your Timeline. Your friends can also view your Foodspotting page to see which dishes you’ve become an expert in. The new Facebook Timeline is all about encourage users to share more, through check-ins, posts, and other activity. There’s not much word yet on how Facebook Timeline will affect business brand pages but Facebook is known for its cohesiveness, so they will likely experience similar changes in the future. 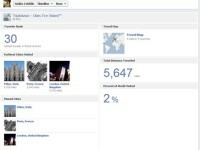 Do you have ideas on how to use Facebook Timeline to promote your business? Please share your ideas in the comments below!